Chiang Mai-born Boonpan, the original boat lady, continued to wear a northern hairstyle in Siam. It was around 100 years ago that the matriarch of the Supatra empire, Boonpan, started what is today the Supatra & Chao Phraya Express Boat Group. The boats were the size of sampans and were paddled across the river by standing rowers with one leg slung around an oar. 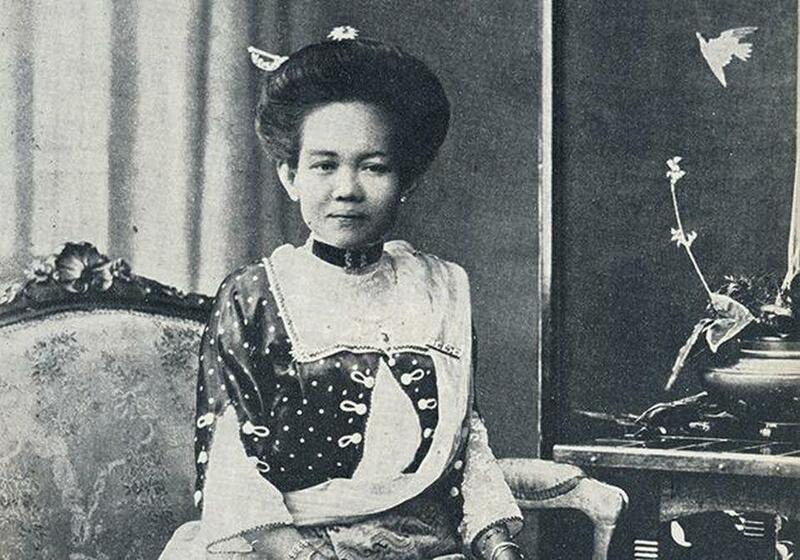 Born in Chiang Mai, Boonpan had accompanied the famed northern princess Dara Rasmi downriver in 1886 on the way to becoming one of the many wives of Siamese King Chulalongkorn (Rama V). Boonpan married a Siamese official and settled on the west bank of the river (where the family's Supatra River House restaurant is today). She sent her youngest daughter, Supatra Singholaka, at age 12 to live and serve in the palace of Rama VI. Supatra later recalled six years in a gilded cage, playing tennis, billiards and bridge with two queens. Shortly after Supatra returned home in 1930, her mother died and a bloodless revolution ended the absolute monarchy. Supatra must have somehow caught up on her studies, surmises her daughter, Supapan Pichaironarongsongkram, because she passed the examination to enroll in the inaugural class at Thammasat University in 1934. Four years later she was among only four women in her graduating law class of thousands, all the while managing the ferry operations. Supatra gradually replaced the sampans with outboard motorboats. By the time she was interviewed by the Bangkok Post in 1965, Supatra Motor Launch Co. employed 300 people and had operations building and repairing boats and piers. The ferry business dropped 40% overnight when the first of ten cross-river bridges opened in 1971, but profits more than recovered after she introduced the up-and-down-river express boats shortly afterward. A prominent advocate for the legal right of married women to buy and own property and to initiate divorce, Supatra had unconventional views of the roles of upper-class Thai women. She told the Post that she expected her two daughters to join the business after study overseas: "I succeeded in business and so can they." Her younger daughter, Patravadi Mejudhon, instead became an actress and theater director. After schooling in Switzerland and England, Supapan majored in French at American University in Washington, D.C., and briefly worked for the Tourist Organization of Thailand, but soon responded to the pull of duty. Since her mother's death in 1993, she has diversified by tailoring boat services for tourists and opening restaurants and hotels. "She did not choose this job," says her daughter, Pim, "but she said, 'If you are given a responsibility, you have to do it well.' "
Interesting side bit of history. A cynic would say that "caught up with her studies" was a diplomatic way of saying her mother had the favour of the king. But I'm not a cynic, so I guess she was a smart lady...as evidenced by the success of her business. Only 40%? There's an insight into normal peoples travelling needs at the time. Thailand's suffragette! Good on her. "She did not choose this job," says her daughter, Pim, "but she said, 'If you are given a responsibility, you have to do it well.' "
Sadly Thainessly fatalistic, yet at the same time proud and honourable.